Much to all Canadians' detriment, a deep level of politicization has eroded trust and contributed to real consequences for the Canadian military and the country as a whole, writes Richard Shimooka. Over the past several weeks, Canadians have been treated to the spectacle of the Government of Canada in a legal sparring match with the counsel for Admiral Mark Norman over his charges on breach of trust. He is accused of passing cabinet confidences to reporters in order to shape government decision-making over the lease of a naval supply ship from Davie Shipbuilding. The admiral’s court filings suggest that some Liberal cabinet members attempted to reopen the contract to support the politically well-connected Irving Shipyards. Boiled down to their essence, Norman’s legal counsel is alleging the Liberal government has put their partisan interests in front of Canada’s national security, and the charges are an effort to punish him for revealing this uncomfortable fact. While these counter-accusations are yet to be tested in court, an appraisal of the government’s relationship with Canada’s military shows a pattern of similar behaviour. With its “peacekeeping mission” election promise, the government dithered for two years before finally offering a modest commitment to undertake emergency medical evacuation in Mali for allied forces engaged in combat. There’s also the 2017 Defence Policy Review, which was intended to provide financial stability to military procurement, but has proven largely stillborn. According to defence analyst David Perry, the government is already failing to deliver nearly half of its intended spending. Yet perhaps the most egregious example of politicization has been Canada’s CF-18 replacement, which is now the subject of an Office of the Auditor General investigation. It started with candidate Trudeau’s election promise to not buy the F-35 and to instead purchase a less costly alternative more suited for Canada’s needs. 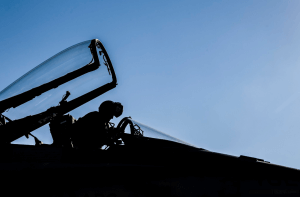 It was an ill-conceived promise, particularly with multiple assessments showing the F-35 as the most capable option, with the lowest lifetime cost. Ironically, the promised savings would be reinvested into the naval shipbuilding program, largely to the benefit of Irving Shipbuilding. Undeterred, the government likely searched for a way to circumvent the procurement process to preclude an F-35 purchase. It soon announced that Canada had a capability gap, which it used to justify the interim buy of 18 Boeing Super Hornets. The alleged gap was a scenario where the RCAF was unable to defend North America and NATO allies simultaneously. However, the entire policy was inconsistent with the Liberal party’s electoral claim that Canada needed a more domestically focused fighter force or that no other military arm was called upon to respond to such an unlikely contingency. Even more galling was how operating two fighter aircraft fleets would exacerbate their capability gap and could eventually render the RCAF unable to defend Canada due to a lack of qualified personnel. Amazingly, these considerations did not deter their efforts. It took a trade dispute with Boeing over Bombardier, and the likely sticker shock of their policy ($6.4 billion for 18 Super Hornets versus $9.0 billion for 65 F-35As), to force a reconsideration. The government’s response was to buy 35-year-old surplus and declared obsolete Australian Hornets to address their urgent capability gap while implementing a five year-competition process to replace the CF-18 fleet. The schedule illustrated further politicization, pushing back a potential decision well beyond the next federal election. Belgium, Denmark and the Netherlands required on average two years to evaluate and select the F-35. Much like with Admiral Norman, the Liberal government actively muzzled any potential criticism. It ignored military advice about the severe consequences of the interim buy and suppressed potential leaks by imposing an unprecedented gag order on procurement personnel. This damaged morale among RCAF personnel, who face the prospect of operating a 40-year-old fighter against cutting edge adversaries. Many are “voting with their feet” and retiring in disgust, stripping the military of critical experience and creating a real capability gap. Admiral Norman’s accusations are to be tested in court next year, but the consequences of the government’s policies are clearly evident now. A deep level of politicization has eroded trust and contributed to real consequences for the Canadian military and the country as a whole. Unfortunately the situation is unlikely to improve in the future, much to all Canadians’ detriment.